A couple weeks ago, I posted a Twitter message, proclaiming: "Flower is the most exhilarating game I've played since God of War." I followed this up with a review in which I praised Flower as a symbol of the video game medium's growing maturity. It was sentiments like mine that likely pushed Leigh Alexander to question some of the seemingly hyperbolic praise bestowed on Flower. While this is a brutal simplification of her argument, the main thrust was to suggest that we 'doth protest too much' when extolling Flower's greatness. I think she has a point; it is easy to get caught up in the release hype of a game, especially one so unexpectedly pleasant as Flower. However, I think it is equally important not to blunt our praise when it is warranted. Regardless of the game's intention, it is one of the few titles that can make the hairs on the back of my neck stand up simply by thinking about it. I sympathize with Leigh's frustration in hearing people talk this way about a game when they offer little analysis as to why they feel such a strong connection (other than "it's pretty" or "it's fun to fly"). And this is where I come back to my God of War connection. Before Flower, the last time I had such a visceral response to a game was when I played God of War. Juxtaposing these games is oddly hilarious, but I love them both for similar reasons. God of War is a game about power and destruction. 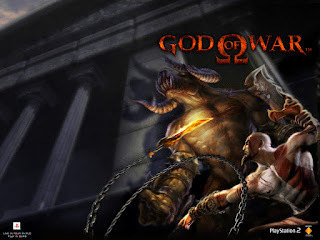 Kratos dismembers his way through a stylized ancient Greece, killing anything foolish enough to get in his way, be it a monster, an innocent bystander, a building, or the gods themselves. Dramatic orchestral scores pervade a world in which the only subtlety to be found resides in how best to obliterate things. Even when the game takes a break from brawling and throws some moving platforms or environmental puzzles at the player, the destructive motifs are retained. Platforms are adorned with vicious spikes, doors are unlocked with human sacrifice, and entire temples act as puzzle pieces manipulated through brute force. While Flower resides on the opposite end of the thematic spectrum, it is equally focused on maintaining its tone. The themes of growth and healing pervade the stages, and are augmented by itsgameplay and presentation. The level design features what basically amounts to locked doors and platforming obstacles, but they are overcome by utilizing the theme of fertility and nurture. 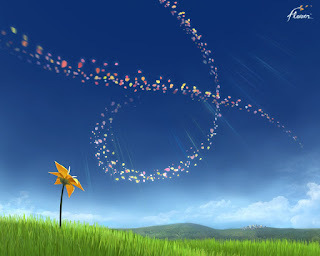 Blooming flowers simultaneously advances thegameplay and the complements the story's theme. The two games are like actors staying "in character" throughout a performance. God of War and Flower may portray vastly different characters, but they exhibit consistent behavior that adheres to and supplements their themes. Regardless of the games' intents or what how people react to them, the games maintain cohesive identities. Players interact with these identities through control schemes that enhance immersion. More importantly, the games stand out as titles that successfully implement control schemes often derided as gimmicks when used in other games. In addition to the fluid, nuanced combo scheme, God of War implements a variety of Quick Time Events. In other games, this gameplay mechanic degenerates into "press X not to die" situations that feel divorced form the flow of play. God of War's QTEs are unique in that they both mimic the action on screen and strengthen the player's connection to the action. Quick, precision stabbings necessitate carefully timed button presses. Twisting the head off a gorgon means rotating the analog stick. Careful, nuanced implementation serves to strengthen the link between the player and the game's events. Flower's controls also provide immersion through both simplicity and the utilization of an oft-maligned control mechanic. The capricious nature of the wind is mimicked through the use of only one button and the PS3 controller's motion control. While one cannot stop on a dime or perform turns with jet-fighter precision, movement is consistent once the player learns how to manipulate its subtleties. The control mirrors the naturalistic themes of the game's graphics and story by making the player rely on flow and intuition when exploring the world. Like God ofWar's QTEs, Flower's motion control is a design choice that, in other games often ends up hurting the experience. In this case, the controls are justified and enjoyable based on their utility to both the gameplay objectives and the game's thematic structure. As I said at the opening, it is easy to get caught up in the hype of a newly released game. Separating lasting feelings from the ones elicited by simple novelty is a delicate task. However, without deeper analysis, we will never be able to discern a frenzy from a lasting experience, nor will we see the sometimes odd connections games share with one another. This was a hard post to write, but it was worth it, as I am now unable to purge from my head the image of Kratos frolicking in a verdant meadow while a handful of petals tickle a Minotaur's nose.